Quotation from an original article? Where is link to original article? Can the link colour be changed, please. This is what the anti-independence parties are unwittingly protecting. Its a bit too much on the “apparently the SNP are progressive” line but given where they are coming from to start with its a massive shift for the good. I found the analysis of Labour interesting and pretty on the money. Its also nice to see its not just the SNP looking at opportunities of independence. But still, no a bad read. Neither side can be seen to lose or actually lose for a variety of reasons. Devo Max fulfils the prisoners dilemma – basic game theory. A federalised parliament, if that’s what Devo Max (whatever) means, would make the Scottish Parliament equal to the Westminster Parliament within the frame work of the United Kingdom constitution. It’s a compromise which would help avoid the schism and strife alluded to in the article. Game theory and the prisoner’s dilemma – the assumption that being ‘rational’ means being driven by a desire to be selfish at others expenses – may describe the mad world of the financial system, but they do not describe an underlying reality (or ‘rationality’) to being human. This is not how humans – in general – actually behave. We act far more out of consideration for others than that, which is why the referendum is likely to be won for independence, and decided in a context of hope rather than fear. Thatcher was superb at summoning up all the fear she could muster at election time, and I’m sure this approach will be tried to its maximum by the powers that be, but there is a far more interesting rule to the game than game theory. This is the rule that – in any competition – s/he who sets the context almost always determines the outcome. A referendum decided in Scotland in reference to Scotland is likely to be won by those seen as putting Scotland first. Tell that to the boy who got all the stuff stolen out of his bag after having had his jaw broken during last August’s riots. The muggers didn’t help him, they helped themselves. Nope, devo max does not mean a federal solution and it would almost certainly mean more, not less constitutional strife in the UK. All devo max would mean is that the two main states achieve a form of parity within the union which would not be enjoyed by either Wales or NI. In fact a goodly number of large English regions would have more than enough grounds to feel grumpy with both Holyrood and Westminster should this unlikely event occur. True devolution of powers down to possibly regional parliaments (nobody understands local problems like a local). Politics would have to change from adversarial, as now, to a consensual form. Most likely a form of PR would have to be adopted nationwide. There would of necessity still be a central parliament but it would be multicameral and fully elected (no hereditary/bought seats anywhere in sight) which would form check and counter check on the actions of the elected bodies. (nothing gets done unless all houses agree). No excursions in Iraq comes to mind. All taxes and resources raised and managed at said regional levels. A written and codified constitution agreed upon by all parties to enshrine the rights of the people. Now here’s the elephant in the room (not the only one but certainly the biggest) – Westminster (which is still a top down establishment) will never, ever let that happen. There is not a snowball’s chance that Whitehall’s mandarins will ever allow the people to dictate the actions of the state and will absolutey not initiate voluntarily steps toward devolving powers from the centre towards all states or regions. They are the establishment and they, like all turkies, will not vote for Christmas. But Scotland is already suffering death by a thousand cuts (pun intended) and we have an out. We can choose to end the treaty of parliamentary union and give the people of Scotland a chance to recover and in fact prosper. This is, IMO, the only option which is fair to all parties, the alternative is to do nothing and let Westminster asset strip and bleed the country till it’s dry. Of course I could be completely wrong, and Westminster will gladly start throwing powers about will he nil he, federalism will prevail as a great idea and I get a hot tip on the next winner of the Grand National, but until then I’m voting for independence and a fighting chance. I don’t know what Devo Max (whatever) would entail either. Who does? I don’t particularly care. I only put that forward as a potential option of what it could look like. I agree with the International Socialist piece and the reasons given that a second question is a must. You could argue a lot of what you said about Devo Max (whatever) could also be said for independence. I’m not really that interested. 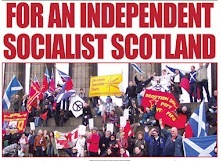 One of the things I hadn’t really given much thought to, which the International Socialist piece covered, was the effect Scottish independence could have on Ireland. This piece was one of the most succinct and perceptive polemics on present and potential political circumstance, I’ve seen in a long time. Bella Caledonia are to be commended for posting and linking to it. It’s the second instance of a Bella Caledonia post providing progression, for me at least, in my current thinking. The International Socialists appear to want a ‘revolution’ of a type I don’t. I don’t think the SNP will give them much truck either. Despite being a good deal more sympathetic toward the idea of independence than the spirit crushing force of Unionism, I don’t want social unrest occurring on the streets with the potential of setting Scot against Scot. There is historical precedent for such a scenario, bonkers as it may sound. And I hope it stays sounding bonkers. Presently, people are coming onto the streets throughout Europe and venting their fury against the withering injustices of plutocratic rule and international finance. The closer we get to 2014 the more we’ll see the rawer side of these forces at work. You’re right though to bring up the analogy of betting on the Grand National while espousing your voting intentions. IMO the independence horse is more likely to fall at Beecher’s Brook than it is to come home a winner. Turkeys and voting for Christmas. Come on. You’re trying to pull my leg with that one. Aren’t you?